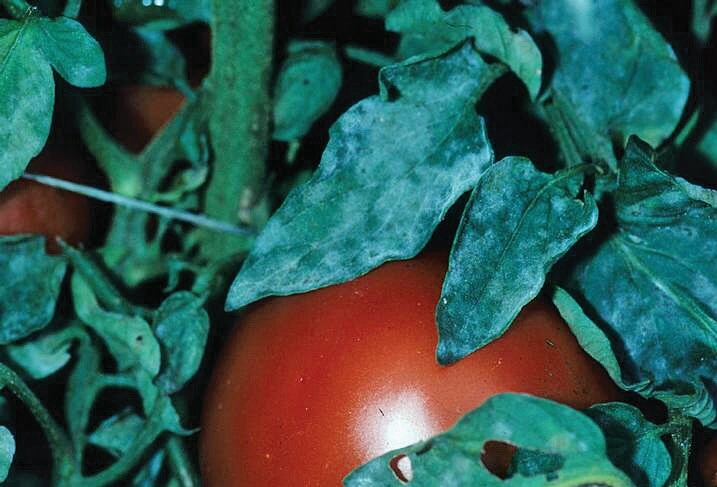 Powdery mildew on tomatoes attacks a plant’s foliage and stems. It’s more common in commercial tomato fields and greenhouses than in the home garden. But regardless of where it attacks, the fungus weakens plants and reduces productivity wherever it thrives. Three types of powdery mildew fungus plague tomatoes: Oidium neolycopersici, Erysiphe orontii, and Leveillula taurica. Fungi are spread by airborne spores, transported by wind or pests, which land on leaves and germinate. Powdery mildew needs living plant tissue in order to grow, but the fungi do not directly “kill” the tomato plants. Rather, they feed on the tomato plant’s cells. Yellowed (then brown) leaves remain, accompanied by white powdery growth. This “powdery mildew” (from which the disease gets its name) grows as thin layers on tomato leaf surfaces. Three factors make tomato plants succumb to powdery mildew: environment (humidity or wet leaves), onset date (the earlier in the season, the more difficult controlling mildew), and treatment (the sooner, the better). What does powdery mildew on tomatoes look like? At least two sets of symptoms appear on tomatoes. Yellow patches on lower leaves eventually turn brown. White, powdery spots appear on leaf surfaces, spreading to cover leaves and even stems. In both cases, leaves of the affected plant eventually die and fall off, leaving fruit exposed to sunscald. Affected tomato plants produce fewer and smaller tomatoes. The fruit that manages to survive has less flavor than healthy fruit. When does powdery mildew on tomatoes affect plants? How do you control and treat powdery mildew on tomatoes? The best control measure for the disease is prevention (see below). How to treat before symptoms appear. One of the most effective preventative treatments is sulfur dusts and sprays, such as Safer spray. But be sure to apply the sulfur product on a still day, when temperatures are well below 90º F. Apply in morning or evening, because sulfur can burn tomato plants in the direct sunlight. If you’ve applied oils to tomato plants, wait at least two weeks before using a sulfur product. You can also treat tomato plants preventatively with a biofungicide like Serenade. Made up of specially-formulated microorganisms that destroy fungi, Serenade can help prevent mildew from infecting tomato plants. Follow label instructions. How to treat affected plants. Begin applications at the first sign of mildew. Horticultural oils and neem oil have helped reduce and sometimes eradicate powdery mildew on plants. Do not apply oils during a drought, when temperatures are above 90º F, or within two weeks of treating plants with a sulfur product. In all cases, thoroughly cover plant with treatments. Repeat every 7-10 days or after rain. Once mildew is present and progresses, it becomes more resistant to biofungicide and fungicide. 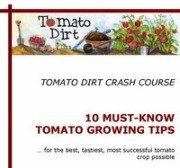 Tomato Dirt best advice: treat preventatively or, if powdery mildew appears, treat as consistently as possible. Test soil. Powdery mildew thrives when nitrogen levels are high. Give them space. Plant tomatoes more than 24 inches apart to let air to move among leaves and prevent the disease from spreading easily. In addition, stake tomato plants for better circulation. Keep weeds down. The fungus can spread easily among all kinds of plants. Avoid overhead watering. Wet leaves allow fungi to spread rapidly. Use drip hoses or other at-soil watering methods. Apply fertilizer at regular intervals. Spikes in soil nitrogen encourages mildew, but systematic feeding maintains levels. Remove and destroy affected plants at the end of the season. While fungi don’t overwinter in northern climates, it can proliferate in more moderate areas and in the greenhouse.